I take great pleasure in working with artists - those who can see tomorrow today. Amongst the visual artists I have made films with are Ricky Romain, an artist whose main body of work is devoted to human rights (see re-Appearances), and John Makepeace, one of Britain's foremost furniture designers and makers. STORIES OF SEVDAH - THE BOSNIAN BLUES is a highly emotional film about the Bosnian music called Sevdah (which means 'love' in Turkish). It tells the story of how, after the Bosnian War of 1992-1995 and the tragic genocide in Srebrenica (July 1995) exponents of this poetic music held onto it, sang, played and performed it, to make sense of their culture and the world that had created the horror of the war. You can see the trailer here, and the film soon to be uploaded here as well. Graham Treacher's DIVINE MADNES; THE VISION OF William Blake is dedicated to Treacher's brothers who, many years ago, introduced him to the paintings of Blake, which have reminded with him all his productive life. This short film was made as an evocation of that to help Graham raise funds to complete the work, which he has successfully done to much acclaim. You can see the film here. Peta Lily's DARK CLOWN shows the thinking behind the deeply funny, deeply painful work she teaches and makes. This film takes the viewer on a journey from the antics of the red nose clown to the angst filled world of the dark clown. Available to watch here. 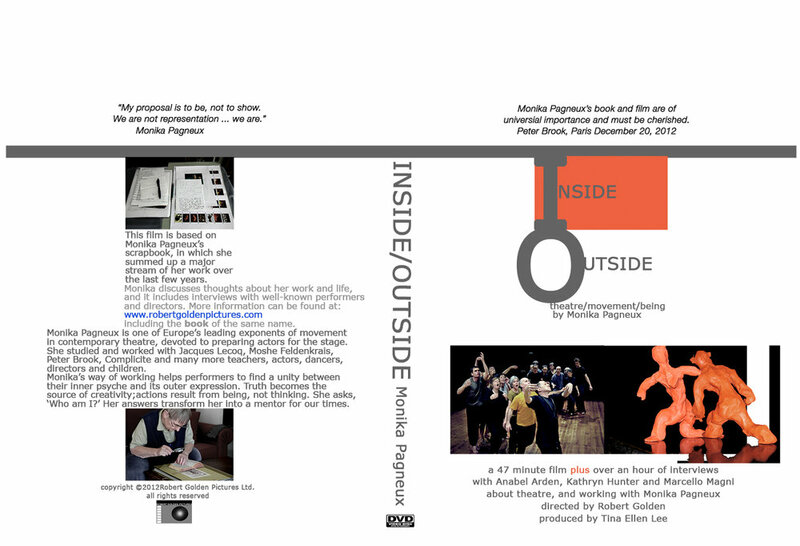 Monika Pagneux's INSIDE/OUTSIDE is about one of the great movement masters of theatre over the last 40 years, whose work with Peter Brooke, Opera Circus and others created standards for emotional truthfulness and physical articulation. For the moment you can see the trailer here and the film for free to view here. David Glass has, over the last several years, produced a string of amazing, shocking, compelling, sometimes vulgar and often humorous theatre pieces which are finding new national and international audiences and students hungry for originality and street-smarts. I have had the pleasure of documenting and otherwise providing media, programmes and in this case, a promo for the work which you can see here.